Lade Clicky Popular Posts Widget herunter. Widget Ausgabe wird nun gecached. Download Clicky Popular Posts Widget. 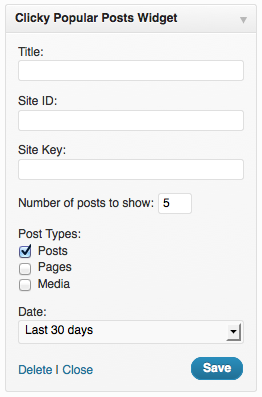 I just came across your Clicky Popular Posts widget and am thinking of using it on my website. I understand I need to have a Clicky account in order to use it. P.S. : By the way, this ressource is also available in English! I’m considering using your plugin for my site – do you have a screenshot of what it looks like on the site? As the output is highly dependable on the Theme context, I decided not to provide a preview. It’s basically a list with post titles, like the Recent Post Widget generates. ich finde Ihren Plugin sehr behilflich. Ist es eigentlich moeglich, Thumbnails neben den Text hizuzufuegen? Ihre einfache Liste von echt populaeren Posts paBt m meiner eigenen Site sehr schoen, aber ich moechte sehr gerne Thumbnails bei der Site meiner Frau, http://deOndarzaSimmons.com, benutzen. Vielen Dank fuer Ihre Muehe, und Alles Gute aus Raleigh, North Carolina, ‚gel? Dadurch, dass jedes Theme Listenelemente anders darstellt und auch dir Größe eines Post Thumbnails nicht in jedem Theme gleich sein kann, habe ich es nicht mit implementiert.